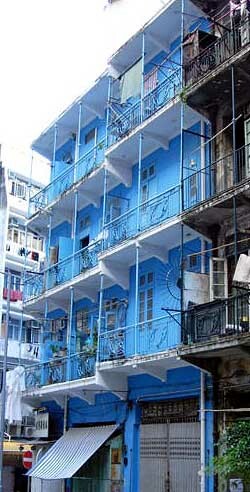 The "Blue House" is located at number 72 Stone Nullah Street in Wan Chai, Hong Kong island. It was constructed in 1920 and has been classified as a Class I historical building. The "Blue House" has a long history: the staircase, the balustrades and the beams are all made from wood; the stairwell is dimly lit, steep and narrow. It is hard to walk up. When you step on the stairs, there are occasional squeaks as if the building is ready to collapse at any time. Outsiders think that the local color and flavor of this old building constitute an irreplaceable treasure but Mr. Chan who has lived here for more than 60 years hates it: "So what if this is a historical site? I don't want it." The inconvenience is one reason not to want to live at a historical site. "The biggest problem is that there is no bathroom. We are still using spittoons and buckets. When we urinate, we use the spittoon and then we flush it down the kitchen sink. What about defecation? Either we sprint to the public restroom down the street, or else we do it into the spittoon and then place the feces into a plastic bag for disposal." On the day of the interview, Mrs. Chan had a case of diarrhea and she complained: "I have been down to the public restroom a few times today already. It is not over yet. The bones in my legs are aching. I'm old and it is not a lot of fun going up and down those stairs. In their entire lives, this couple has never had a private toilet. They have never enjoyed a bathroom, shower or air conditioning. "When we bathe ourselves, we pour hot water into the plastic bucket and wipe our bodies with a towel. What do you mean a shower? We don't have air conditioning because the electricity bill is too much and it is too difficult to install air conditioners in old buildings. In the heat of summer, our biggest luxury is to run the electric fans." But having no toilet, shower or air conditioning is nowhere as annoying as the continual requests for photography and visits. Mrs. Chan said: "I hate letting other people take photographs. Every day, many people take photographs downstairs from the outside -- reporters, television crews, tourists, students ... every time I go out to collect my hanging clothes, I am anxious. I check whether there is someone taking photographs first before I go out. This is worse than being a movie star!" Mrs. Chan was right. On the day of the interview, the reporter personally witnessed someone taking a photograph of the blue house, causing Mrs. Chan to exclaim: "See! They are filming again!" She continued: "Many groups want to visit the house and ask us to present it; many people just show up and ask to use our old furniture for movies. They have borrowed our old clock and large mirror. Someone even wantd to rent the apartment for filming." They don't their apartment messed up and so they have always refused. However, that does not prevent the problems. "We may not rent the place out, but our neighbors might. We would be impacted all the same. When they make the movies, all sorts of people walk up and down the stairs all day. They talk loud, they smoke and they curse. We can't sleep." But the nuisance comes not just from passersby. The government departments such as the Housing Department and the Land Department also make unannounced visits. "Sometimes, they want to make sure that we are not illegally sub-letting. Sometimes, they want to see if there is any structural damage to the building. It is annoying!" Mr. Chan said that the apartment has 1,000 square feet, but he can only afford HK$1,500 in rent. So he has returned two rooms and two penthouses back to the government. Thus, certain sections of the apartment is sealed by government stickers. Even though they rent the apartment, they cannot enter into those areas. "Forget about entering. It is not even permitted to leave even an umbrella or a pair of shoes at the entrances." Mister Chan said that he has lived here since when he was a child. It was socially presentable to live in an apartment with one thousand square feet. But he is now forced by circumstances to continue to live in this state. "I'm 77 years old. I retired a long ago. I live off a small pension. My wife does not work. My eighteen-year-old daughter is still in school. All my expenses come from the pension plus HK$2,200 in welfare payments. We are not in good shape. We cannot afford to rent or buy an apartment elsewhere. We have to continue to live here. At the moment, I hope most of all that the government can give relocate us to public housing." The second site is Number 612 Shanghai Street, Mongkok, Kowloon, Hong Kong (note: not far away from the Number 624 building described in Historical Preservation Sites in Hong Kong) and the residents are a 60-something-year-old couple named Hui who are tailors for traditional Chinese clothing. From the time of the grandmother's generation, they have lived at this site. Their children have moved out long ago. Concerning the historical preservation status of their residence, they said: "It makes no difference. This is just a run-down building. Twenty years ago, I was hopeful that the building would be demolished and we could move. But things dragged on for a while and now it has become a cultural site that cannot be demolished. Our dreams of relocation have been dashed. The floor, door, frames and windows and even every brick on the outside are "original." Nothing has changed over eighty years. Outsiders will find it familiar, because it is classically old just like in a Wong Kar-wai movie. But for the Hui's, this is a troublesome residence: "So what if it is classically old? The maintenance is a nuisance. The flushing toilet was installed just a few years ago. The stairs are steep and required strength to climb. Fortunately, I live on the second floor. There are many problems that outsiders don't appreciate. If it were not for the fact that the rent is cheap and the location is convenient, we would have moved out a long time ago." Mrs. Hui also complained that the government has never sent anyone to learn about the conditions. They don't care and they don't want to know. But the reporters are a nuisance as well: "Every day, some reporter knocks on the door. The media are more interested than the government. The government only has empty talk and they don't mean what they say. My biggest wish is to get relocated." Shanghai Street is a busy street. Due to the convenient location, many minibus drivers and drunkards relieve themselves in that stairway. Mrs. Hui said, "Living in a historical preservation site means that you have to wash away the urine left by other people every day."